If you're a woman and you've wished to have an extra arm, clone yourself or that days had 25 hours instead of their mere 24... regardless of whether you work outside your home or not, whether you're single or married, have children or not, this planner will be the single most important step you'll ever take to regain control over your own life. I don't believe in magic formulas, or empty promises that claim to fix your whole life in a day without ever asking you to lift a finger. The Planner you're getting is working great for me, and it's the exact system I've used to manage my business and organize my time efficiently, while raising my son alone, to make sure I have some time to myself while I also teach courses and have published ten books this year alone. So here's the catch: I've been using this very system to "multiply" my time so that I can enjoy my son's childhood and be there for him, work with my VIP consulting clients, continue my education in different fields, grow my business on my own and keep my home feeling like a home while I have the luxury of getting enough sleep. 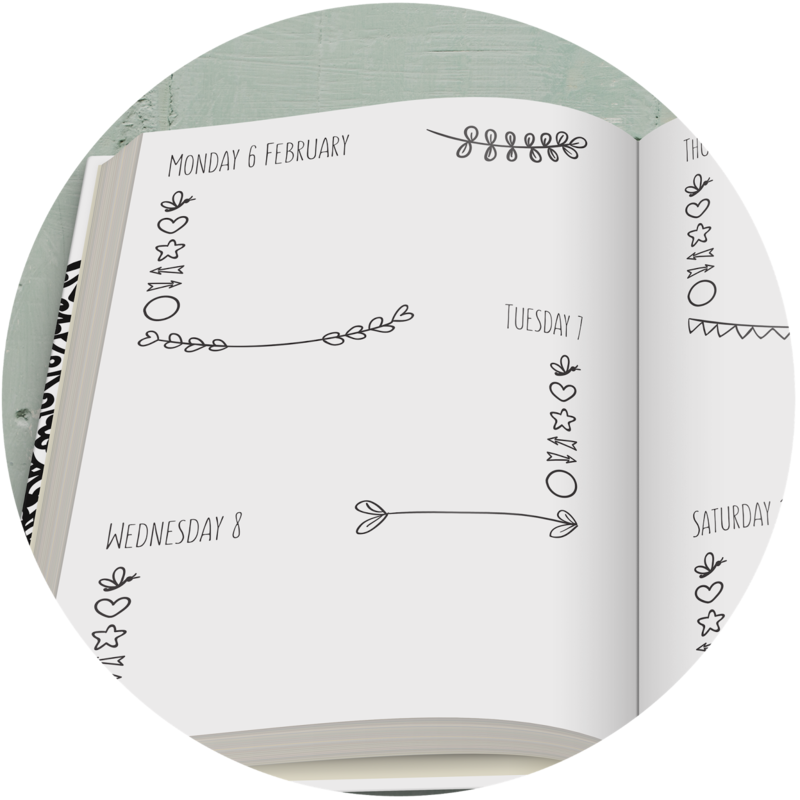 I'm not suggesting that everyone who gets a Happy Agenda Planner is going to magically multiply their time and attain all their goals. I don't know how much the people who get it will achieve -it's likely it won't help you at all if you don't implement the system and work on your goals, using its tools, day after day-. The thing is, I don't know you and I'm not about to insult your intelligence by claiming this planner will magically solve all your problems. At the end of the day, you're the only one that can step up and make a change. There's no planner in the world, no coach or mentor that can make the mindset shift for you. This planner is dramatically different from anything you've ever used before because it combines different time management and goal achievement systems in a single place. So it's a sort of hybrid between a "field guide" and a traditional planner. That's the reason why it's so effective. There's no fluff or filler. It immediately gets down to brass tacks, showing you exactly what to do, how to do it and why. It has some simple, fun and easy exercises for you to fill in and reflect upon past and present habits that you can fill in in less than an afternoon. And you'll immediately "get" the entire methodology I'm personally using to keep my life organized which is one of the secrets behind the success of my work-. 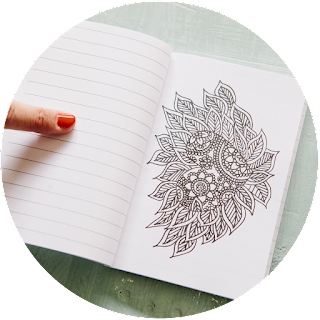 A tool to bring back inner peace and get rid of guilty feelings any time you take some time to yourself (page 11). A place to plan than vacation you've been dreaming of for so long (page 27). An exercise that will help you beat the blues and pick yourself up when you're having a grey day (page 23). A methodology that will help you not only learn from your mistakes, but also make sure you don't make the same errors again -as well as celebrate your victories no matter how big or small- (pages 21 and 22). 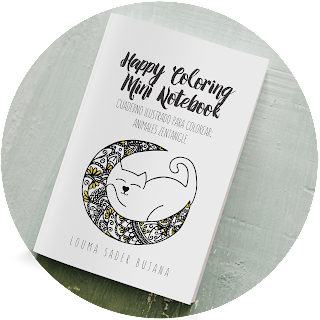 More than 300 little illustrations to color and one larger one at the beginning of every month -neuroscientists insist that coloring (who'd have guessed?!) is not only fun but also an excellent way to reduce stress. A technique that will take you no more than one minute per day that will ensure your work time is exponentially more productive and efficient. A daily practice that will help you reconnect with gratitude and appreciation as well as give self-care the place it deserves in your life. As women, we tend to set ourselves aside in favor of our children or loved ones, or even work. Dedicating enough time every day to self care will radically improve your health and wellbeing, and when you're doing fine, everything else in your life falls in place. It's not selfishness, it's common sense. 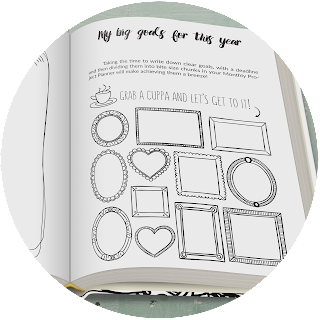 Yearly calendar, four month view, monthly planner, monthly project planner, weekly view and so much more to help you clearly and easily plan your projects from the bigger picture to bite size pieces that make you feel accomplished and stress free. That when we work from home we end up dedicating many more hours to work than if we could close the office door and leave work behind. Don't we? Well, enough of that! It's time to enjoy yourself again, spend quality time with your loved ones and learn how to get maximum leverage out of your efforts. I mean real, effective, proven tactics that will work for you as soon as you implement them. And you won't find my pioneer system anywhere else than in this very planner. And like I said, this REALLY WORKS! Just in case all of the above was not enough to get you over the wall with excitement, you will also get these 7 resources you will love! And other exclusive bonuses you'll find on a secret page inside the planner. I know there are websites out there that offer you something tempting and then pull a bait and switch. There's NO hidden expense or anything remotely like that. I'm literally giving you all these gifts and tools, plus a free paper notebook when you order your Happy Agenda Planner 2016 before Febryary 1st 2016 as a way of "putting my best foot forward" and demonstrating real value. I've ordered 100 copies of my new notebook as a test. They are packaged up and ready to be shipped immediately. Because my community is made up of over 100k families, subscribers, alumni and customers that are reading this letter just as you are. And the last time I released a new book, it reached number one bestseller during the first 24 hours on launch day. Supplies are very, very limited and you need to claim your copy now. Once I'm out of notebooks, that's all she wrote. 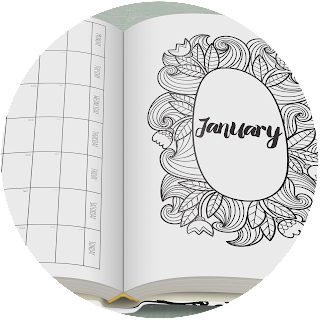 When you order your Happy Agenda Planner on this page before February 1st 2016, you will receive 7 fab bonus gifts so you can leverage your time by utilizing the same techniques I use to optimize my time and efforts, enjoy my son while he's growing up and grow my business. 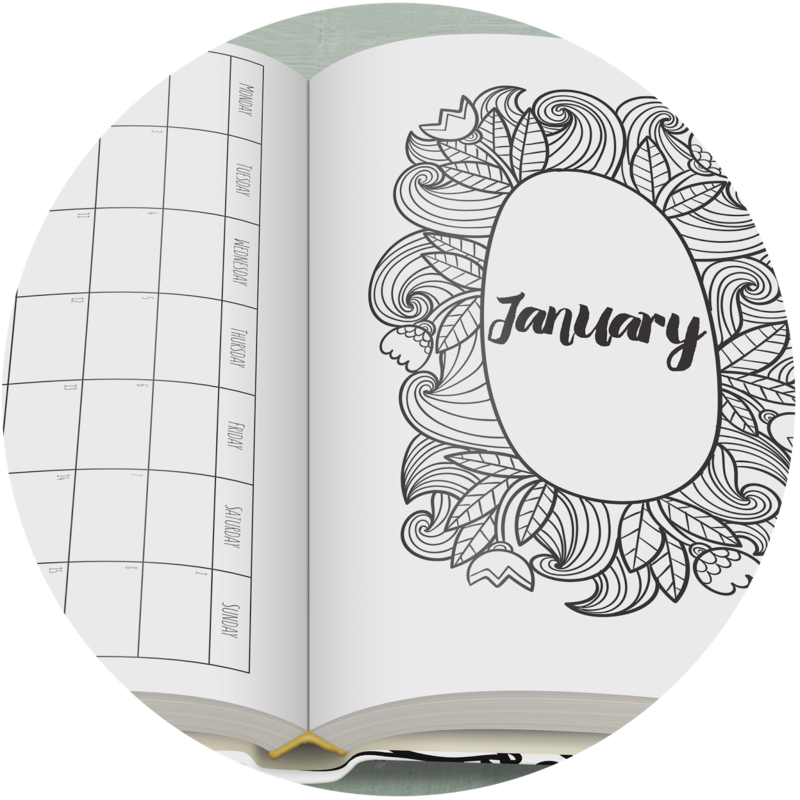 Happy Agenda Planner spans from January to December 2016. After placing your order, come back to this page and click on the button at the bottom of this page, send me your info and I'll make sure you get your gifts. 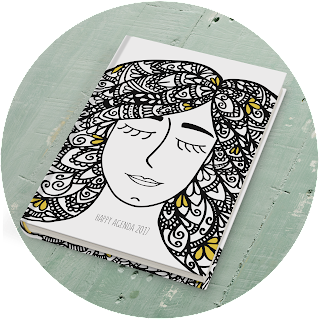 This offer is extremely limited because I only have 100 notebooks to give out and I'd love to get yours to you today. The last few times I published a new book, it quickly climbed to number one bestseller in under 24 hours -so it's more than likely that these free notebooks will run out. I'm giving it to you as a gift because I want your feedback before I release it to the public. There is no "catch" to this offer. You will not be incurring in any other expenses, or anything like that.